A somewhat contraversial book, almost one that you either love or hate. The story line is basically an American author travels to Italy to follow around the Serie B club Castel di Sangro. It certainly has the makings of superb work. It has all the ingedients: desperate relegation struggle, a small isolated town, the local mafia don that owns the club, etc. At times, you wonder what planet McGinness comes from, as he exhibits a certain degree of, err, naivite. 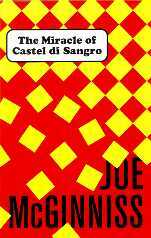 Castel di Sangro throws a game. He's outraged, to the point of being ridiculous. What, corruption in Serie B? Gee, what a novel concept! Who'da thunk it? What ultimately saves the book is the topic itself: the wonderful story of Castel di Sangro and their struggle in the Serie B. McGinniss was given a unique insight into the Italian game, with all its faults. Unfortunately he lets his ego get the way of the story, or perhaps he tried too hard to make himself the focus. This book should be read, but you might want to consider borrowing from the local library.